Designed and taught by Brenda Stofft! If you loved Brenda Stofft's Artemis and Astrid, you will adore Medici! 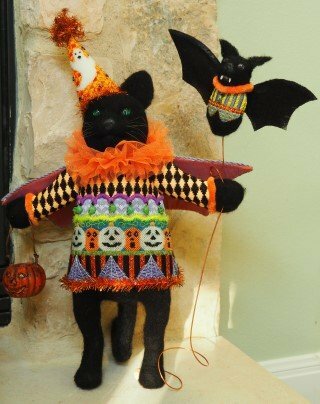 Learn how to make this 14" tall, 3D needle-felted black cat and his tethered friend, Nemesis. The first 2 days we will focus on needlefelting his face and ears. The second 2 days will address the needlepoint elements of his outfit, cape, hat, and Nemesis. This is one of the most unique stitching experiences you will ever have! Note - Choosing this class pays for the class fee deposit only. We will contact you for credit card information for the balance on of your class fee, your canvas, stitch guide & kit, and thread kit. Cancellation Policy - For needlepoint project classes, student cancellations must be made at least six weeks prior to the first session to receive a refund for the class fee. After that date, class fees are not refundable and cannot be transferred to another class. Any canvas, threads, stretcher bars or supplies purchase for the class are also not refundable. 3 Kittens will only cancel a class if no students have signed up; however, we may need to reschedule due to weather or illness.